Can We Save Honey Bees By Breeding Them With “Special Characteristics”? Have you heard of "The Super Bee"? Scientists and breeders of bees are attempting to breed honey bees with particular characteristics – for example, better ‘hygienic behaviours’ in an effort to ‘save them’. Hygienic behaviours include bees that have learned to groom mites off themselves, perhaps 'biting' the mite to kill it, and it may involve bees grooming each other. Dealing with Varroa mite (in turn, sometimes cited as a way of dealing with Colony Collapse Disorder. In some cases of colony collapse disorder, Varroa mite is not present, so breeding bees which can deal with Varroa may not solve the colony collapse issue! 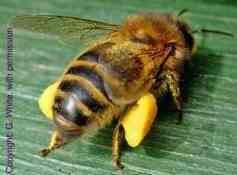 Interestingly, however, in cases of colony collapse, pesticides are found in hives, which may include bee medications (i.e. when pesticides are used to treat pests that attack honey bees). Pesticides may even be implicated in cases of Varroa - as stated above. Breeding honey bees will not help other pollinators and invertebrates which are also suffering worrying declines. I believe all invertebrates play their role in the eco-system, whether or not we understand it. Is the 'Super Bee' A Sticking Plaster Approach To The Problems? In one sense, I can see why breeding honey bees (or creating The Super Bee) which appear better able to cope with stresses, may seem to be a good thing. It may even be our best option. However, when we keep tampering with bees like this, I wonder if we REALLY know what we are doing, or we only THINK we know. In a few years when we have done yet more messing around with bees, will we change our minds? Will scientists disagree - again - as they so often do on so many issues? Too often, the way man tinkers with nature reminds me of Micky Mouse in Fantasia. Micky Mouse, as a trainee magician, decides to perform a little magic, and before he knows it, it all gets out of hand, and he cannot reverse his own ‘Micky Mousing around’. And sometimes when man tampers with nature, he reminds me of the muddle-headed meddle-wit, who takes apart a radio to see how it works, then puts it back together again…..only now he mysteriously finds he has spare pieces….and he had no clue how those ‘spare bits’ were important to the whole! Not that I believe all of humanity is so bad - I just think there are a minority of people causing a disproportionate amount of nonsense. And are we merely adopting a ‘sticking plaster’ approach to dealing with an issue, without any regard for the bigger problems we need to address, such as the way in which man interacts with and treats the environment and other species in pursuit of short-term profit for the vested interests of a few? 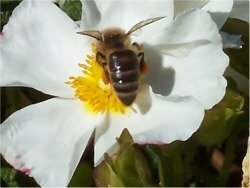 It's important that the wider population realise that hearing positive reports about honey bees dealing with Varroa does not mean all is well with all pollinators. Sometimes it seems we humans treat the Earth and its resources like a testing laboratory for all our tinkerings (and our motives may be varied). Let’s not be lulled into a false sense of security – if we breed the Super Bee, will we prevent the collapses we have seen in honey bee colonies? Will everything suddenly be hunky dory with the environment? I’m certainly not convinced about the latter. What I want to see is real and meaningful action to address the problems we are creating, which I believe are largely environmental and man-made, and completely avoidable. I want a scenaria where we don't need to breed 'Super Bees'. What will we be doing next? Breeding bumblebees with 'Go Faster' stripes? I tend to think that, to save bees (and biodiversity generally), speedy, positive "behavioural evolution" in humanity with regard to the way we treat the planet and the creatures we share (note SHARE) it with, would make the biggest difference. How eating organic can help the bees.